Gnjilane is a city in eastern Kosovo. There are buses leaving from Pristina to Gnjilane every 20 minutes for about 2 euros one way, from Ferizaj/Uroševac there are bus connections about every 30 minutes. One can travel from Bujanovac to Gnjilane by bus though but the schedules can be unrealiable. Saint Nicholas Orthodox Church is located in the city centre. It was built in 1861 on the foundations of an older church building, and has been renovated many times since. It houses a nice collection of icons and church items. Entrance is free. Bell Tower at Draganac Monastery. 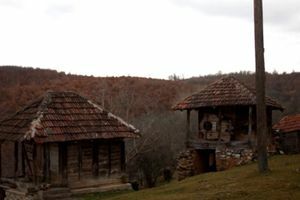 Draganac Monastery is located about 10 kilometers north of the city, and there is very little or no public transportation in that direction. The monastery was founded in the XIV century, deserted and destroyed during Ottoman rule, and reestablished in 1869. It is dedicated to holy Archangel Gabriel. 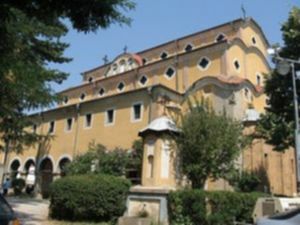 There is a spring of water with reputed healing powers in the monastery. Entrance is free. 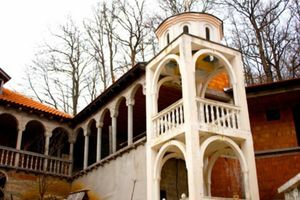 A guesthouse for visitors is slated to be completed in May 2015 and visitors are welcome to attend services at the monastery which are held daily from at 6 am and 7 pm respectively. Visitors are also encouraged to have dinner with the monks and other parishioners after evening services. When visiting the Monastery note that while not strictly expected it is considered traditional to bring the monks juice, honey, or vegetable oil though some other foodstuffs from your home country will be greatly appreciated as well. These supplies are used to feed other visitors. If attending services do keep in mind that modest clothing is recommended, covered legs and shoulders are expected of both genders. This page was last edited on 6 June 2018, at 17:46.